Three ways to effect weight change. The 80/20 rule for cutting calories. Make calorie-burning fun and/or profitable. Enter your current age as an integer (no decimals or fractions). Enter your height (without shoes on) in inches. Use the decimal equivalents for fractions (for 1/4 enter .25, for 1/2 enter .5, for 3/4 enter .75). Enter your body fat percentage if you know it, expressed as a percentage (for 28%, enter 28). Refer to the Weight Loss Calculators section to calculate your body fat percentage. Select the activity level that best describes your own daily activity level. Select whether you want to lose or gain weight, then enter the number of pounds you wish to lose or gain. Select the desired time periods (days, weeks, months, years) and then enter the number of periods you want to take to achieve your weight loss goal. This is the estimated number of calories you will need to consume per day in order to maintain your present weight. This is the estimated daily caloric intake target you will need to shoot for in order to achieve your goal weight. This weight loss, gain, and maintenance calorie calculator will calculate the daily calorie target you will need to aim for in order to achieve and maintain your desired weight. Plus, the calculator will tell you whether or not achieving your goal weight in the specified time frame can be done within the "Safe" zone. Finally, the calculated results will display a bar chart showing the difference between your daily maintenance calories and your daily goal calories. Enter your height in inches. If you need to convert feet and inches to inches, expanding the description will reveal a mini calculator for quickly converting feet-inches to inches. Enter your body fat percentage. This is an optional field but completing it will give you more accurate results. If you're not sure what your body fat percentage is, you can use a tape measure and the Circumference Method Calculator to come up with the answer. Select your average daily activity level. Select whether you would like to gain or lose and then enter the number of pounds. If you are having trouble deciding how much you would like to weigh, you can calculate your ideal weight here. Select the time periods you would like to use to set your timeframe goal, and then enter the number of corresponding periods. 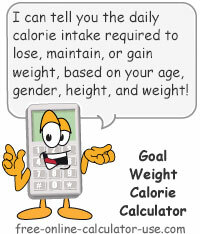 Click the "Calculate Daily Calories" button. If the weight and timeframe combine to put your daily target calories at an unsafe level you will need to adjust the pounds down and/or increase the number of time periods until the "Unsafe" message disappears. The energy required to raise the temperature of 1 gram of water by 1 degree Celsius. The typical adult needs 1,000 to 1,400 calories per day just to fuel basic organs (minimum requirement is referred to as Basal Metabolic Rate, or BMR). An additional 400-600 calories are needed to go from laying still all day to moving around during the day. For every 3,500 calories you take in that are over and above the amount you need to maintain your weight, you will gain 1 pound. The total weight of your fat divided by your weight. Consists of essential body fat (1-3% in men, 8%-12% in women) and storage body fat. Three ways to effect weight change and how I achieve the most success. I'm certainly no expert in the field of weight-loss, so all I can do is to offer you tips that have worked well for me. These tips, as with most other tips on this site, are based on simple, common sense principles that don't require an expensive book, plan, or miracle cure to implement. Weight management is really a very simple concept. Your body requires a certain number of calories (units of energy) each day in order to support its daily activity level. If you take in fewer daily calories than your body needs for its daily activity level, your body will use stored body fat to subsidize your intake -- causing you to lose weight. On the other hand, if you take in more daily calories than your body needs for daily activity, your body will add to its fat reserves -- causing you to gain weight. Adjust your daily caloric intake. Adjust your daily activity level. If the 80/20 formula applies to caloric intake as well as it does to so many other areas of our lives, then that would mean that 80% of the calories we consume comes from only 20% of the food and beverages we consume. And if that's true, then we only need to identify and cut out the food and beverages that are in the 20% group. As a real life example, I love a certain name brand cookie and have a habit of having 2 cookies after lunch and 2 after supper. That one habit adds up to 213 calculators per day alone -- which is about 1/3 of the daily calories I need to cut out in order to lose weight at a desirable and safe rate. For me the secret to increasing my calories burned on a consistent basis is to choose calorie-burning activities I either enjoy, or I deem to be profitable. I get bored to death on treadmills but I love to golf. So instead of spending five lunch breaks per week being a zombie on a treadmill in the summer, I choose to burn the same number of calories by walking and playing one 18-hole round of golf with my family and friends. In the winter when the golf courses are closed I do spend an hour each weekday on my elliptical machine, but while doing so I take lynda.com online training classes via my laptop. And while I don't typically enjoy spending time on the elliptical machine, I get so engrossed in the video lessons that I often lose track of the fact that I'm even exercising. Of course, since I'm increasing the value of my product (me) while studying concepts I'm genuinely interested in, my time on the elliptical is both enjoyable and profitable. For me the best way to lose weight is to formulate a plan that combines exercise I enjoy and/or deem profitable, with cutting out a portion of the 20% of foods and beverages that account for 80% of my caloric intake. That way I'm attacking the extra weight from both fronts -- without giving up all of the foods I enjoy, and without having to dread going to the gym every day. But that's just me. What To Do To Increase Calories Burned? If your daily calorie consumption is above the target suggested by the calculator, and you prefer to make up the difference by increasing your activity level -- instead of by reducing your calorie intake -- visit the Exercise Calorie Calculator to put together a plan for increasing your calories burned.